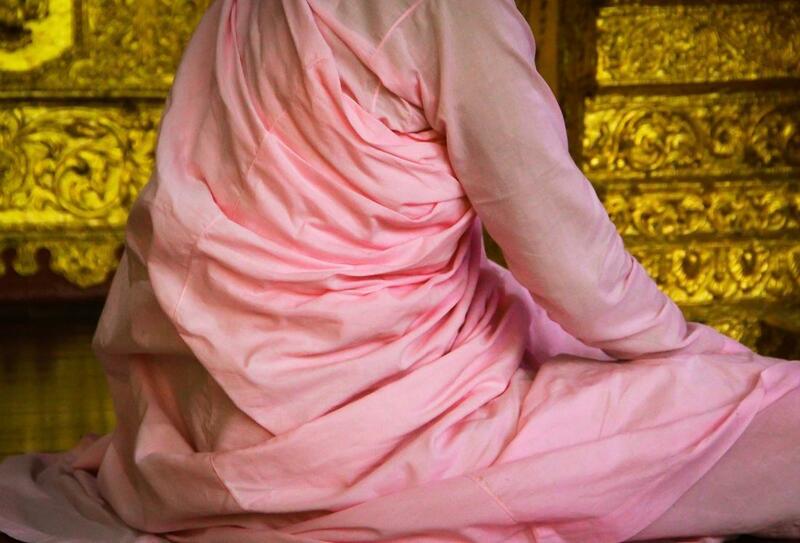 While visiting the Shwedagon Pagoda in Yangon (Burma), I took some time to look at the details of this Buddhist nun’s pink robe and its harmonious folds. As I watched it, I couldn’t help thinking at the beautiful classic Greek sculptures or the Renaissance paintings with their superb drapes. I had a lot of time to see Buddhist monks and nuns when I visited Shwedagon Pagoda in Yangon (Burma) since I got stuck due to a strong and long thunderstorm. That religion plays a relevant role in Myanmar is easy to see but didn’t know that Burma is the county with the highest rate of Buddhist, accounting for some 80-90 percent of the population. In Burma, Buddhist nuns after the Theravada tradition (meaning ‘the Ancient Teaching’) wear a pink robe with a touch of orange, while the majority of monks wear dark saffron-colored robes, unlike the orange robes that are mostly seen in Thailand, Laos and Sri Lanka. The color of the robes inspired the name ‘Saffron Revolution‘ given to the 2007 marches by Buddhist monks to protest against the military regime in Myanmar. Throughout Burma, Buddhist monks and – to a minor extent – nuns, are a common sight and a symbol of the country culture and history.